I use Firefox. My teammates all use Google Chrome, so I reluctantly switched so that our site would get some field testing under at least two browser types. Firefox uses a lot of memory. Even more so when firebug is active. There are times when my browser will lock up and I will have to close and open it again. So with that off my chest. And the Firefox memory issues in mind. I was delighted to hear about running a website in Google Chrome as an app. 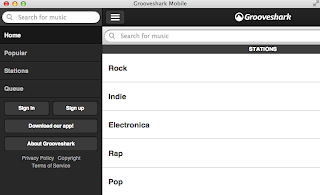 The reason is that now I can listen to Grooveshark through Google Chrome, without opening the full browser, it feels like a very lightweight way of doing things. Note that your Google Chrome must be closed (quit the program please) for this to work. Otherwise it will just show you the browser you already have open.